BREWER - Donna Herweg, 86, died peacefully at her home of 57 years on August 3rd with her loving family and friends at her side. She was born in Brewer, in her parent’s home on February 19, 1932, the daughter of Reginald S. and Harriet (Hall) Booker. Donna was a graduate of Brewer High School. She was married to Dean Herweg and they resided in the home they built in Brewer all of their lives. In early years she was a waitress at the White Elephant restaurant before starting and running several businesses over her working lifetime. She sold Dutchmaid in home parties for many years, owned 3D Variety on Wilson Street in Brewer, and after that became part owner in Caps Tavern in Brewer before retiring. Donna was also an active member of Zonta International and is credited for creating the fundraiser, The Zonta Holiday Marketplace, held in Brewer for some thirty years now. 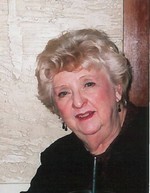 She also served for many years on Brewer’s Board of Appeals. In addition, Donna was an avid reader and longtime member and supporter of the Brewer Public Library. After her retirement Donna was half of the movie review team on 92.9 WEZQ ‘Mom and A Movie’ with her daughter, Dorian. Donna was predeceased by her mother and father; her husband, Dean Herweg; son, David Dean Herweg; and brothers, Paul, Earl ‘Nathan’, and Reginald Booker. She is survived by her brother, David ‘Lindsey’ Booker of California; son, Daniel B Herweg, and his wife, Gayle; daughter, Dorian Lear, and fiancée, Terry Spencer; grandchildren, Daniel D., and Jason Herweg, and Nicholas Worster; and great-grandchildren, Dryden Lenny, and Alekzander Worster. We also wish to give a special thanks to all the wonderful people who cared for mom these last years, Patty England, Penny Metivier, Emmalee Blaisdell, Gloria Hutchins; and nieces, Bonnie, and Brenda Booker.